6. Age limit : 24 – 41, Only candidates born between 02.01.1974 and 01.01.1991 (both dates included) are eligible to apply for the post. Candidates from other Backward Communities, Scheduled Castes and Scheduled Tribes are eligible for usual age relaxation. 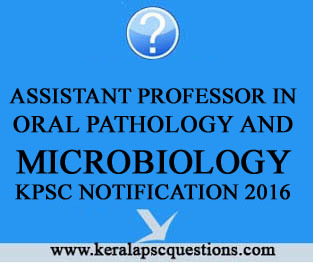 (1) Post Graduate Degree (MDS) in Oral Pathology and Microbiology from a recognised University approved by the Dental Council of India. (2) State Dental Council Permanent Registration. (3) Three years Teaching Experience. Note:- (i) KS & SSR Part II Rule 10 (a) ii is applicable. (iii) Provisional Registration with any Medical Council will not be accepted.